For this post in our researcher blog series, we decided to examine some interesting examples of researchers integrating the data into their workflows. We also reached out to the six academics who created these examples, to review their usage and collect some feedback (positive or otherwise) about their experience of the data. Three out of the six researchers we talked to said they had first heard about Altmetric from other academics, either on Twitter or through internal communication within a university. This is interesting as it suggests that one academic’s knowledge of a tool can potentially change the behaviors of their peers, whether that’s all the other researchers in their faculty, or all their followers on social media. 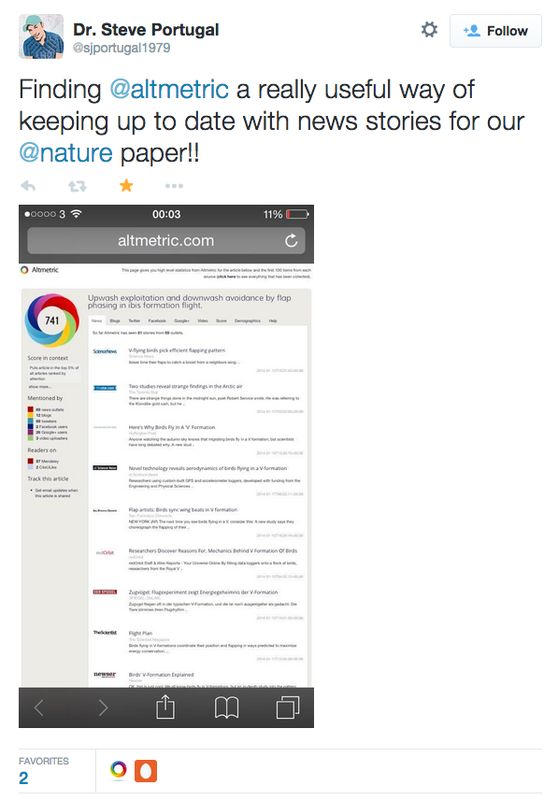 In last month’s blog post we briefly talked about how academics can use Twitter and altmetrics to keep up-to-date with research trends. However, perhaps it’s also worth noting that conversation surrounding research management tools can itself start a trend, and that being active in such networks can open up a whole world of informative and timesaving possibilities for researchers. Two other academics said they recalled seeing the data displayed on publisher’s websites, and this had inspired them to learn more. How have researchers used Altmetric data online? 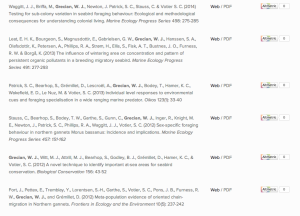 All the researchers we spoke to had investigated the Altmetric data for their articles, and a few had taken further steps to embed the data in their online profiles. 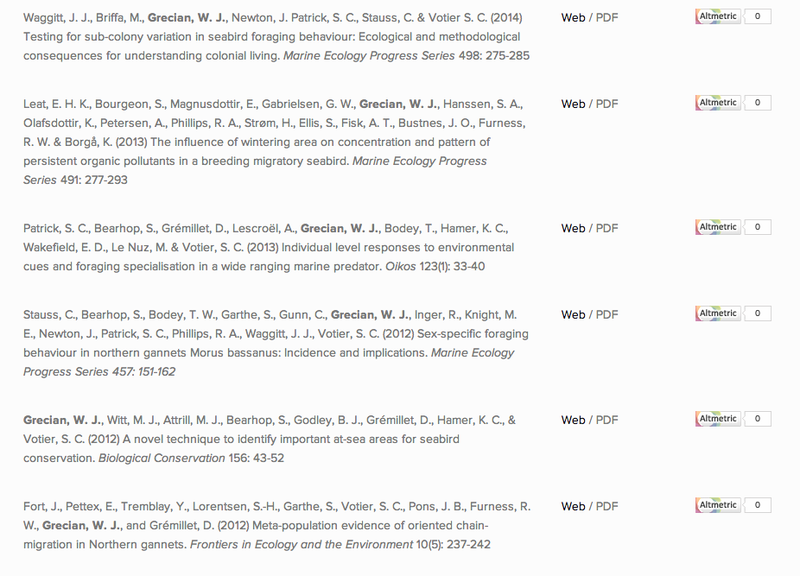 Looking at these examples, it’s clear that adding the data to publication pages or merging it with a unique ORCID ID can add another dimension to your digital identity as a researcher. Because the colours for sources such as Twitter and Facebook correspond to the platforms’ logo colours, the donut is both an aesthetically pleasing infographic and a way of showcasing the online attention papers have received in one easy click. 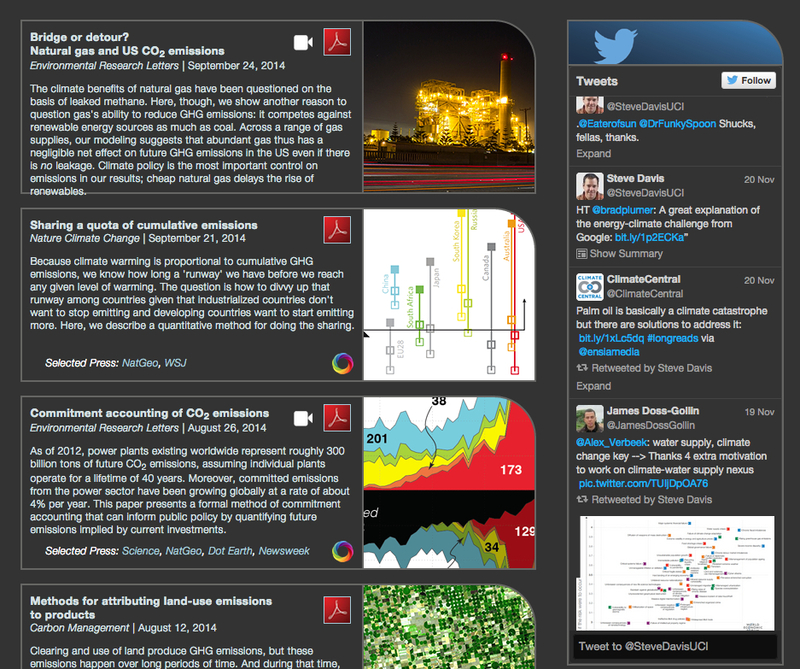 For Steve Davis, adding the data to his online profile saved him time and allowed him to display attention from a range of sources simultaneously, rather than through manual recording; “I have in the past curated my own list of news outlets and blogs that have covered my work in order to track what kind of reaction it was getting”. Davis also said the data prompted him to think about social media monitoring, which he had not been doing previously. 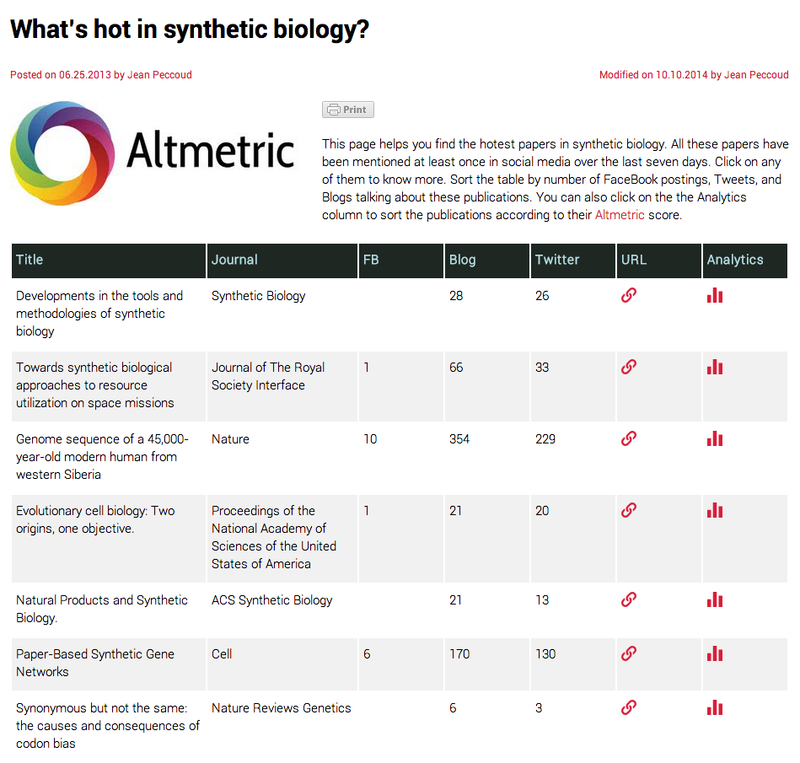 James Grecian said he found Altmetric provided “a useful way to curate and link to the media articles that mention my research”, and also commented that he found the badges easy to use. Egon Willighagen found the Altmetric/ORCID app saved time as he “did not have to look up the statistics manually…it uses my ORCID profile to get the DOIs and aggregate stuff”. What did the researchers discover as a result of using the data? Researchers who had used the bookmarklet said the data had helped them in other ways. Vincent Scalfani (assistant professor and science librarian at the University of Alabama) said he had used the bookmarklet to view the attention for a short autobiographical commentary he released about his childhood and career progression and was pleasantly surprised about how much attention it had received. He theorized; “as this article is more of a commentary and not a research article, it will likely not receive many (or any at all) official literature citations”. This is a fascinating insight as it testifies to the idea that altmetrics can offer an indication of real-time attention beyond citation counts. It’s also interesting to think about how this feeds in to the idea that altmetrics can capture the impact of more reflective personal pieces as well as write-ups of scientific investigations. Thus, for Vincent, the data solved the problem of awareness, by providing him with readership information for a non-traditional research output. Steve Portugal of Royal Holloway University “used the data in grant applications as additional evidence for the general interest and impact” to strengthen his academic profile in the eyes of funders. Steve reported that the data meant he could showcase his impact and better understand the value of online communication channels such as Twitter when trying to promote research and grow an online network. He said one of the reasons why social media sites like Twitter are valuable for researchers is that “explaining your work to a general audience is an excellent exercise in communication skills”. Brian D. Earp (University of Oxford) added Altmetric statistics to his online CV, in the hope that “those who look at my CV will get a sense that that my papers are in fact being read and downloaded, and how they’re doing along those dimensions compared to other papers in the same journal, or of a similar age etc”. For Earp then, the data became a benchmarking and contextualisation tool as well as a way of showcasing impact. Further use cases: how did the researchers use the data to target an audience? In the image opposite, you can see Jean Peccoud’s attractive and sophisticated laboratory website, which uses the Altmetric API as a way of “providing dynamic and valuable content to the visitor of my site”. Jean said the data helped him “figure out what to read”, by allowing him to gage the level of online attention for papers. Although we never try and suggest that the Altmetric data provides a measure of quality this use case is interesting; Jean used the data to develop a reading list, then added it to one of his web pages, thereby allowing his peers to discover the data for themselves. It was interesting that although the researchers gave a range of responses when asked how the data had helped them, their answers were quite consistent when they described the initial aims they had in mind when they started to play around with the information. 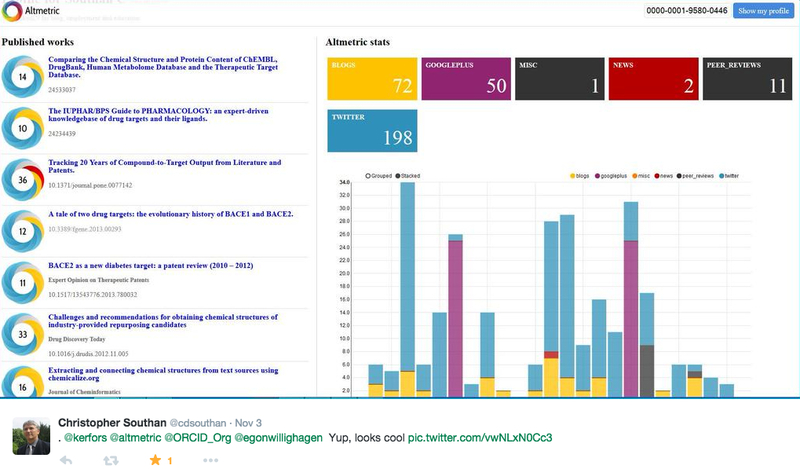 Egon Willighagen summarised his motive for using Altmetric as follows; “getting insight on how my research (not just papers, but including those) is used and what people say about it is important to me, and helps me make strategic decisions on where my research funding chances lie”. All six of them said they wanted a way of showcasing the attention their papers had received, whether to get the attention of grant funders (Steve Portugal), the notice of a tenure committee (Vincent Scalfani), or the general interest of people visiting their online publication lists. We also wanted to hear about the downsides, so we asked the researchers one more thing; whether they felt there were any limitations with the data or things they hoped to do with it in future. One of the really interesting responses came from Jean Peccoud: “the score sometimes feels a little like black magic”, while Steve Davis mentioned “the unpredictability of what the service picks up and what it doesn’t”. 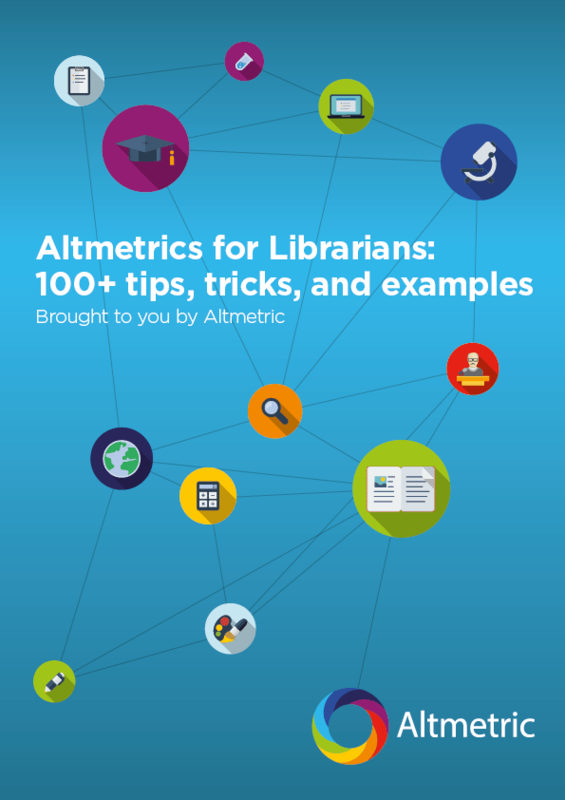 Vincent Scalfani also said that more documentation on this issue might be beneficial for researchers, posing the idea of “an overview to explain what is being measured, what the data sources are, and how Altmetric fits into measuring research impact”. In our next post in this series, we are intending to lay out the logic behind the score and sources more clearly, so hopefully we’ll be able to address some of those questions then. For now, anyone can visit our support resources pages for some slightly more detailed information on how we collect and rank mentions from different places. In summary then, these responses can tell us a lot about how researchers are using Altmetric right now, and about how they would like to see the tools and support resources develop in future. The feedback suggests the data is useful as you can see who has been talking about your research, and then take ownership of this information by adding it to important documentation and incorporating it into your digital identity. It also seems like researchers welcome the realisation that their research doesn’t exist in a vacuum; that they can compare their Altmetric statistics with similar articles in the same academic discipline. As always, we’d love to know what you think about this post, so please feel free to comment with any feedback/questions you may have. 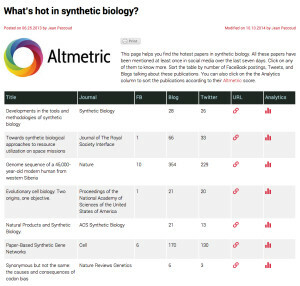 Please get in touch with us if you’d like to request an API key, and visit this page for more information about embedding the Altmetric badges. Thanks for reading! nice to see some researchers do know how!